One of High Point's distinguishing features is its sustainable homes, which are resource-efficient and environmentally sensitive. The community's green, eco-friendly vision deeply influenced High Point’s home/building design, construction process and amenities. Market research prior to development affirmed strong consumer awareness and demand for these kinds of sustainable homes. As a result, High Point boasts efficient and healthy homes beyond what is required by code, protecting residents’ health and the environment, and saving energy costs. Sustainability began with construction, as 22 of the older buildings were deconstructed by hand so high-quality old growth fir could be sold or re-used. All housing at High Point is required to meet or exceed a three-star rating by Seattle's Built Green program. 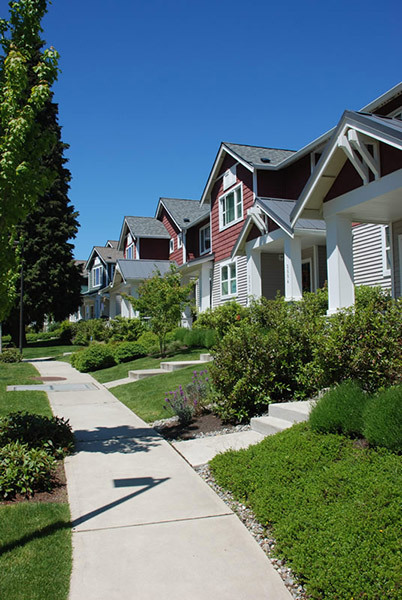 This residential green building program and rating system was developed by the Master Builders Association of King and Snohomish counties in partnership with the city of Seattle. The three-star rating is the highest achievable in the "community" and "multi-family" categories. Three-star certification requires a minimum score of 300 points on the Built Green scale. To earn this rating, High Point standards included the use of recycled or reused building materials, topsoil, and pavement in the construction of housing and trenches. Indoor environmental quality was ensured through the use of no- or low-VOC (volatile organic compound) paints, adhesive and cabinetry to reduce emissions. Homes also include moisture-resistant drywall. Energy-efficient appliances, windows, doors, insulation and fixtures go beyond code requirements to save energy and water. All townhome-style rental units were also built to meet ENERGY STAR® standards. Each home features a high-efficiency hydronic heating system. All rentals units have ENERGY STAR® dishwashers, tankless water heaters, and front-loading washing machines. High Point also features 60 Breathe Easy Homes®. These are independently-verified units structurally enhanced to improve interior air quality for residents suffering from asthma or allergies. These innovative homes were designed and built as rentals for qualified low-income families. Childhood and adult asthma is approaching near-epidemic levels across the U.S., especially in major cities. High Point’s development team wanted to address this pressing health issue and take advantage of evidence that lifestyle and environmental changes can reduce incidence of and suffering from asthma. Seattle Housing Authority's High Point team collaborated with the University of Washington School of Public Health, Neighborhood House, King County/Seattle Public Health, and the American Lung Association of Washington to implement a long-range outreach program designed to improve indoor air quality and reduce the occurrence of asthma attacks in children. While all homes at High Point were built with features to improve air quality, Breathe Easy Homes are constructed in ways that help further decrease the risk factors that cause asthma, with special features to reduce indoor air pollutants. Original residents of Breathy Easy Homes participated in a scientific study that documented health outcomes to compare the old and new living environments. Residents were chosen by surveys assessing the severity of asthma in the family's children. Then, specialists educated the families and monitored changes. The study revealed remarkable results: asthmatic children in Breathe Easy Homes have 63 percent more symptom-free days than in their previous homes, and showed dramatic improvements in lung function. Improved health resulted in a 66 percent reduction in the need for urgent medical care. And as asthma symptoms and triggers declined, the family's quality of life improved: fewer sleepless nights, less lost work and school time, increased exercise and outdoor activities, and lower medical expenses. Quiet, whole-house fans with two-speed timing switches to remove moisture. Filtered fresh air intake ports in all living spaces and bedrooms to improve indoor air quality. Airtight drywall installation to reduce moisture penetration and inhibit mold growth. Low off-gas vinyl flooring with recycled content in bathrooms and kitchens. Low volatile organic compound (VOC) paint throughout. Sealed cabinet construction to reduce emissions. Positive pressure house ventilation systems with air filtering, tempered fresh air supply, and heat recovery to improve indoor air quality. Linoleum flooring in living areas and bedrooms, recycled content vinyl flooring in bathrooms and kitchens, and low-pile carpeting in stairs and halls to reduce dust and other allergens. Low/no off-gas trim and millwork to reduce urea formaldehyde bonding agents. Low/no off-gas or VOC cabinet construction. High efficiency particulate air (HEPA) filters and vacuum cleaners. Hydronic heating system to reduce airborne particles and organisms. Walk-off doormats to reduce dirt in the homes. Construction sequences that include extra dry-out time to minimize mold growth; weather protection of on-site materials; ductwork protection to minimize dust; extra cleaning cycles with low/non-toxic and non-allergenic cleaners; and flushouts to allow the evaporation and off-gassing of materials. Smoking was prohibited during and after construction. Landscaping outside these homes include no-pollen native Pacific Northwest drought-tolerant plants. All participants are required follow rules that ensure the highest possible air quality for the children (no smoking, no pets, and elimination of specific cleaning agents).